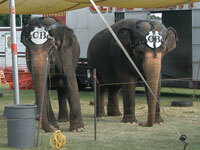 Early in 2013, Los Angeles City Council will vote on a circus elephant protection ordinance. This opportunity must be seized to ensure the strongest possible measures for elephants are passed. An intense campaign by ADI secured a proposal to ban wild animal acts, so we were disappointed when L.A. City’s PAW Committee rejected the strongest measure on offer – a full ban on wild animal acts (elephants, lions, tigers, bears), which would have brought L.A. in line with hundreds of cities and twenty countries around the world. We organized for many months with emails, letters, leaflets and petitions. The ADI team met most Council members or their senior staff, addressed Committee meetings and submitted evidence. Advocates who wrote to Councilmembers include actress Lily Tomlin, Bob Barker, Alexandra Paul and Jorja Fox, all calling for a wild animal ban. Keeping a balance between our heavyweight background briefings and shocking videos, the ADI team also took City Hall by storm with a posse of friendly animals knocking on office doors and delivering information. The ADI campaign highlighted that it is not just physical abuse that these animals endure. It is often unrecognized that the restriction of movement can cause even greater suffering. 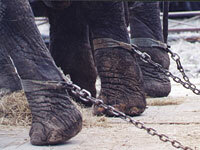 During our recent cruelty prosecution (p14), evidence provided by Professor Donald Broom of Cambridge University and the elephant’s previous vet was that the constant chaining by two legs caused suffering, and in Professor Broom’s view, these conditions caused her to suffer more than the beatings. It is the problems associated with restriction of movement and inability of the animal to interact normally with its environment, that are particular to the traveling circus. The concrete and asphalt parking lots at Staples Center and Shrine Auditorium are not suitable habitats for any wild animals and certainly not elephants. Thirty-eight jurisdictions across the U.S. have introduced restrictions on animal circuses; thirty-two are on wild animals. Although it is disappointing that an opportunity has been missed to protect all suffering animals, an elephant restriction is a positive step and addresses an area of concern; so ADI will work hard for this. Option A. End the use of elephants in traveling shows and exhibitions. Option B. A prohibition on use of bullhooks (aka guides/ankuses) and other tools capable of inflicting pain, in a public performance context. Option C. Combines A and B, ends use of elephants in traveling shows, together with a ban on the use of bullhooks and other tools capable of inflicting pain. ADI is recommending support for Options A and C, as they offer the greatest protection. Option B, the ban on the use of bullhooks and other weapons, addresses part of the problem, but does not deal with the issue of keeping animals commonly chained and confined in small spaces at inappropriate facilities on hard surface like parking lots. By addressing only the problems for elephants, this measure already has a very narrow focus, so it is important that the option chosen by the City Council is as effective as possible. Certainly, taking the most straightforward and effective solution now will save the City Council’s time in the long term. An end to elephant use in traveling shows does not prevent circuses performing in any town or city, shows can be adapted. Like all American businesses, circuses must change with the times to stay relevant and profitable and human only shows are thriving. Cirque du Soleil for example has shown that there is an expanding market for traditional human circus performance; in L.A. they are now opening more shows and staying in venues for longer, offering substantially more revenue and employment to the City than offered currently by the wild animal circus shows. If you live in LA please write to your City Council Member. Letters are more effective than email. The Traveling Exotic Animal Protection Act, which would prohibit the use of wild animals in circuses across the U.S., has continued to gain cosponsors. It is vital that we continue to build support so that this Bill can be reintroduced in 2013. Please contact your members of Congress and urge them to support a ban. And if you can get a meeting, let us know and we’ll arrange for an ADI person to join you. October & November: a Cole Bros. Circus truck carrying elephants crashed in a ditch in Mississippi; the Jaws of Life were used to remove llamas, zebras and camels from the wreckage of Universoul Circus trailer on a highway in Georgia and chaos ensued when a camel escaped Ramos Bros. Circus in Glendale, CA and ran across four lanes of traffic. First steps taken in Anaheim, California, when a motion to ban wild animals in circuses was introduced. ADI met with the Mayor and council members and organized citizens to testify. Although this motion was withdrawn through lack of time to brief the City Council on the key issues, we expect to return to this issue in Anaheim. ADI helped convince Rio Rancho, New Mexico Council to reconsider plans to remove protections from recently secured animal ordinances, including circus restrictions. The Council is taking more time to consider changes and public input. put on a spectacular series of animal free circus shows at the Avalon Theatre in Los Angeles. 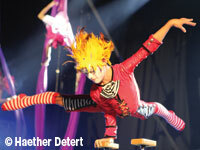 Featuring the gymnastic, youthful talents of the Le Petit Cirque, the show also featured animal stories – including Bambek, rescued from a Bolivian circus by ADI recounting his tale – and clips from the launch of TEAPA, HR3359. ADI had an information table and displays at the event. A great night and a clear message: Circuses don’t need animals.